Home > Plumbing Tips > Why Is Drain Cleaning Maintenance Important? Think about what goes down your drains on a daily basis. When you are washing dishes, different types of grease and food particles get washed down the drain. When you are taking a shower, hair, soap, and dirt make its way through your home’s plumbing system. 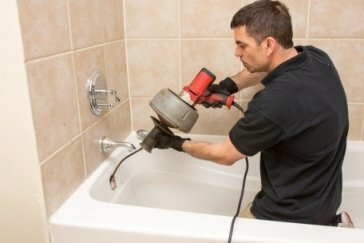 If you don’t clean out your shower and sink drains regularly, all the buildup can wreak havoc on your home’s sewage lines and pipes. It is important that you schedule drain cleaning routinely in order to minimize future problems and damage to your home. Improves the lifespan of your drain – Regular cleaning can actually increase the lifespan of your drains by minimizing the damage that can accumulate over time. Gets rid of bad odors – Drain cleaning removes food particles and debris that are trapped in drains. When you have your drains professionally cleaned, this can remove foul odors as well. Faster drainage and reduce clogs – Drains can be prone to obstructions over time, which can lead to serious clogs. Cleaning your drains can clear clogs and you’ll even notice faster draining as a result! Keeps expensive repairs at bay – When you schedule regular drain maintenance, you can often catch small issues before they turn into big problems. Whether you have aging pipes, overflowing pipes, or pipe-damaging clogs, your plumber will be able to spot these early on.